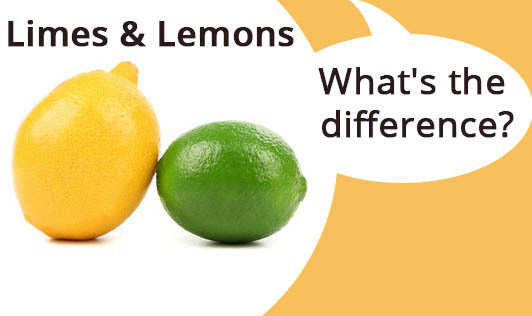 Limes and lemons - what's the difference? Lemon or lime? There's always a big confusion around it! How many times have we picked up limes instead of lemons and vice versa? By the time you finish reading this article, you will have a better idea about the difference between them. • Limes are green in colour and lemons are yellow in colour. • Limes are usually smaller than lemons. • Limes are sweeter than lemons. Lemons are sour to taste. • Limes are usually round in shape and lemons are oval. • The thickness of the skin of limes and lemons vary. While limes have thin skin, lemons have thicker skin. Apart from these physical differences, limes and lemons vary in their nutritional values too. The vitamin C content of 100 gms of lime is 29 mg, whereas lemons have 53 mg/100gms. They also vary in their vitamin A, calcium, folate and potassium content. Now that you know the difference between lime and lemon, you can pick out exactly what you want the next time you're in the market!